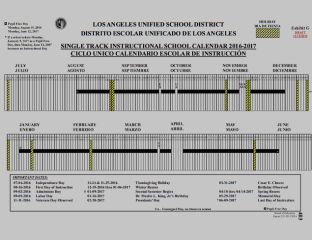 The LA Unified school board spent more than an hour last night, debating dates for the next three academic calendar years. Ultimately, the members decided to keep the schedule similar to this year’s — starting in mid-August with three weeks of winter break — but only for one year. The plan passed on a 5-2 vote, with George McKenna and Richard Vladovic dissenting. The board also agreed to study the matter further before committing additional years to the same schedule. The debate centered on issues including time enough for college applications, the burden of childcare over a long winter break, the length of summer vacation and how the schedule not only affects student grades, but also their attendance, which translates into money for the district. In the process, the board generally discounted the district’s efforts to survey more than families by phone, computer and community meetings for their preferences. Schmerelson said he attended all of the community meetings held by the district to get input for the calendar and concluded that the survey was confusing. The district also conducted a phone survey in September, another two months later and made available an online survey. The responses showed that a majority of parents and teachers supported mid-to late-August start dates rather than an after-Labor Day start. Most also said they wanted the first semester to end before winter break. New superintendent Michelle King also said student body presidents and school administrators preferred the mid-August start. For the first time yesterday, a student sat among the board members and cast “advisory” votes on every issue before them. He pointed out that having a shorter summer impedes plans for summer internships and that “people make plans and have commitments.” He voted to adopt the one-year plan with the schedule suggested by the superintendent’s staff. In the adopted calendar, the first day of school will be Aug. 16, 2016 with a full week of vacation over Thanksgiving, as it was this year. The first semester ends Friday, Dec. 16 and school resumes on Jan. 9, 2017 after three full weeks of vacation. There is a Spring break from April 10 to 14 and the last day of school is Friday, June 9, 2017. Three parents spoke against the new schedule, citing family trips and hopes for a longer summer. Debra Moreno Garcia, a parent of two LAUSD students, cited studies saying that a semester split by the winter break doesn’t necessarily mean more failures in tests. In arguing for a later starting date, Vladovic cited the expenses of air conditioning schools during the summer. In past years, a longer summer schedule resulted in more than $4 million in added expenses. “But of course, these days it gets to 90 degrees in December, so that’s hard to predict,” he said. McKenna proposed his own schedule that would start school after Labor Day. “We do not need a whole week off during Thanksgiving,” he said, but staff pointed out that absenteeism rises over a shorter Thanksgiving break. “Obviously, people are passionate about the calendar,” said board member Mónica Ratliff. Assistant superintendent Earl Perkins said that the staff had recommended the schedule for three years so that families could plan vacations and that the MiSiS computer system could be programmed well in advance. Click here to sign up for the LA School Report newsletter, and don’t forget to follow us on Facebook and Twitter.